"The Only Point I Like In Autobots: Melting Point"
Waaaaaaay back in the early mists of time (in the year 2009) I dedicated my first post on this site to one of my favourite items in my G1 Transformers collection: MB’s Laserbeak! 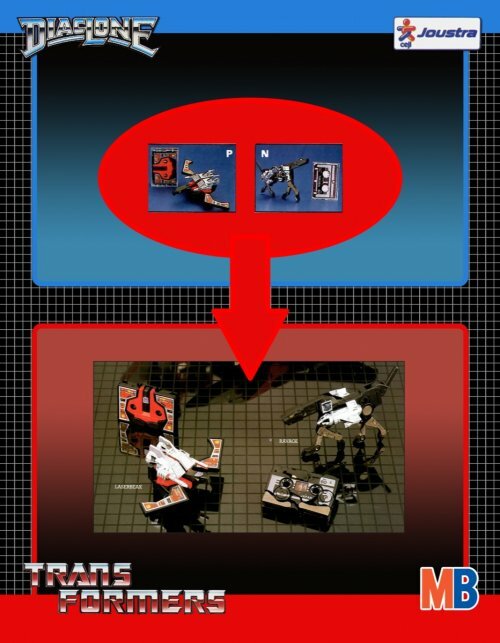 Since then lots of new information has been discovered about the early European Transformers releases, which this particular Laserbeak is a part of. Reason enough to warrant a new blog post dedicated to the old bird, I thought. 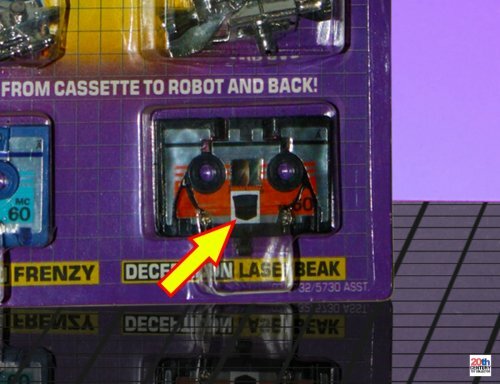 Let’s have a more in-depth look at MB’s Laserbeak!! 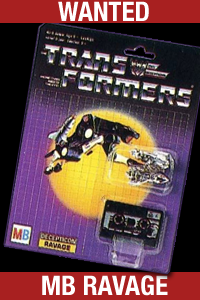 Laserbeak is one of several cassettes that were created for the evil Decepticon Soundwave. The idea was pure Japanese genius. Have a robot transform into a cassette player and then, to top that off, create smaller robots that change into cassettes that fit into the aforementioned cassette player! 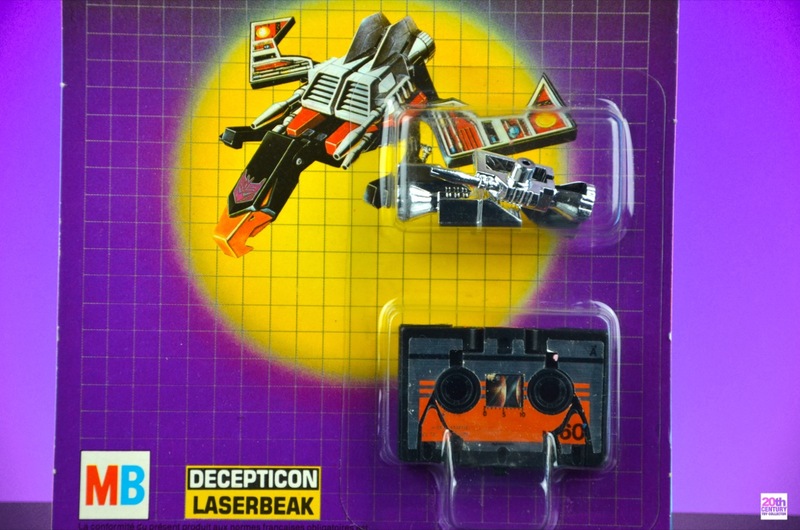 The name Laserbeak is -of course- a rather clever play on the term “laser beam”. 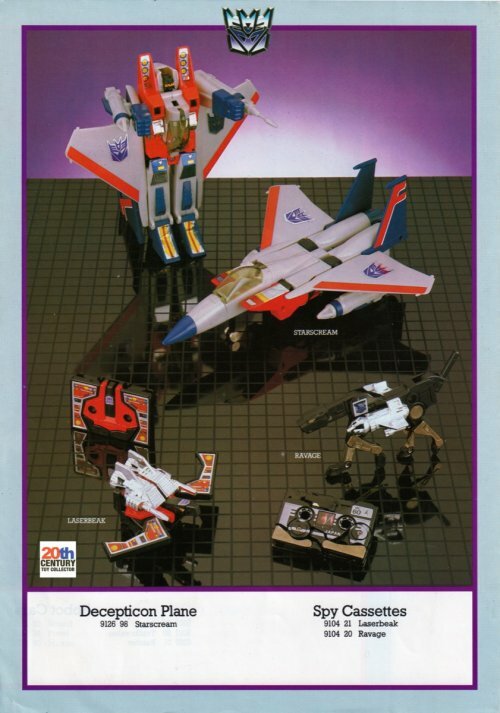 The name was thought up by Marvel Comics writer Bob Budiansky, who was also responsible for writing the cool Transformers bio’s for most of the tech spec cards in the early days and almost every frickin’ other Transformers name there was in the first few years! With that little history lesson out of the way, let’s shift our focus back to Laserbeak! 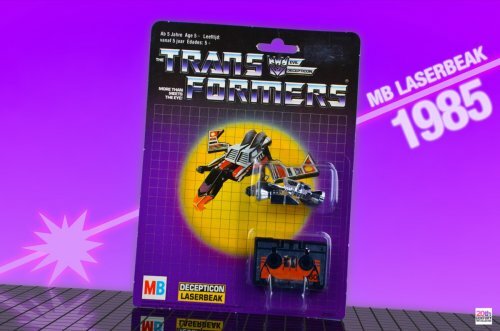 One of the reasons why I like the MB version of Laserbeak so much (as a collector who likes to collect vintage toys in their original packaging) is that the packaging design is rather unique. Most of the other G1 Transformers that were released in Europe came in packaging that was nearly identical to the original American packaging, but with slight alterations for the European market. 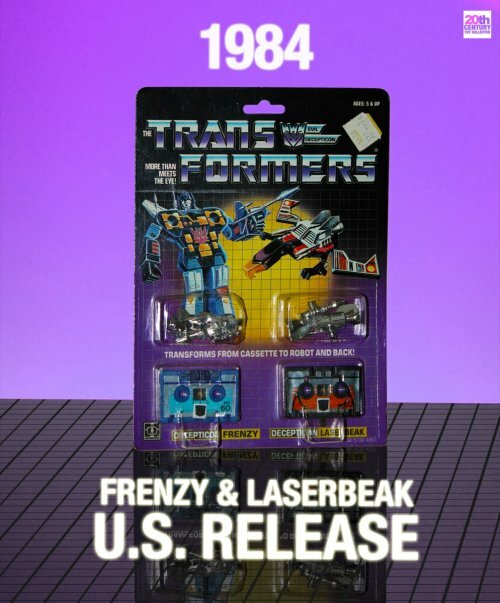 Problem is, that for the release of Laserbeak MB did not have a ready-to-go American packaging design to copy and adapt. Why? Well, because in the US all the cassettes were sold as dual-packs and Laserbeak came together with Frenzy. Doesn’t it look amazing? The yellow spotlight behind Laserbeak looks a lot like a hot and scorching alien sun and adds a very dramatic feel to the whole. Also, if you look very closely and compare the artwork on this MB card with that of the American card you can see that the MB Laserbeak artwork has been rotated a couple of degrees counter clockwise, which adds to the impression that this bird of prey is getting ready to dive towards an unsuspecting victim! That.. is.. cool..
Let’s have a detailed look at the rest of the front of the packaging. 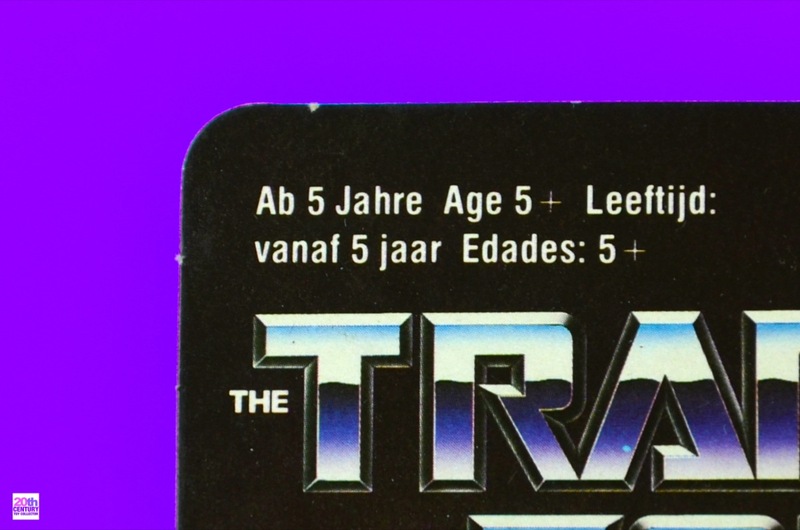 At the top left corner of the card we find the quad-lingual age notice (in German, French, Dutch and Spanish) split over two lines, just like MB’s other wave 2 minibots have (the wave 1 MB minibots have the age notice at the opposite side of the card and on one line instead of two). While the American Transformers packaging almost exclusively uses the Eurostile family of typefaces, the texts that are added to the European packaging are exclusively done with the Helvetica family, as are the age notices above. Moving on to the bottom left of the card we see the MB logo instead of the Hasbro logo. Notice also how the MB logo takes up more space than the Hasbro logo usually does on the American packaging. The Hasbro logo on American packaging usually takes up exactly four grid squares. The MB logo box is slightly larger than that and as such does not align perfectly with the grid on all four sides. Again the wave 1 minibots are different in that respect. While the wave 2 minibots have this oversized MB logo, all the wave 1 minibots have a “normal” sized MB logo, which is exactly four grid squares. Below the logo there’s some text in French. It’s a legal statement saying that compliance of this product with all French laws is guaranteed by MB France S.A., the French Milton Bradley subsidiary. It looks like products sold in France were legally required to have this statement and contact information on the packaging. 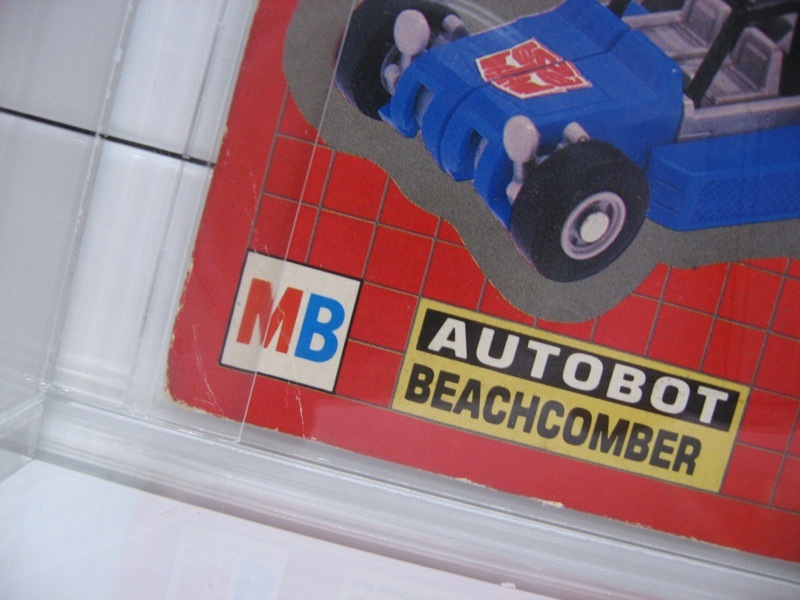 I have seen examples of MB Transformers packaging where this exact statement is included in the form of a sticker, because the original packaging did not carry the statement. Note also the contrast between the typefaces. Laserbeak’s name badge is printed in Eurostile, while the legal blurb below is printed in Helvetica. MB’s logo by the way is also Helvetica. Moving right along to the opposite side, on the bottom right, we find the SKU (stock keeping unit) code of MB’s Laserbeak, which is 9104 21. Now let’s turn the card around and see what we can find on the back of the packaging. First, here’s a photo of the back of the card in its entirety. Our first point of interest is the tech spec section, which takes up half of the card. The size of the tech spec section is bigger than that on American Transformers packaging, because of the need to display four languages instead of one. Also, this means no room was left for the bio, so only the function and motto remain. Here’s a close up photo of the tech spec section. 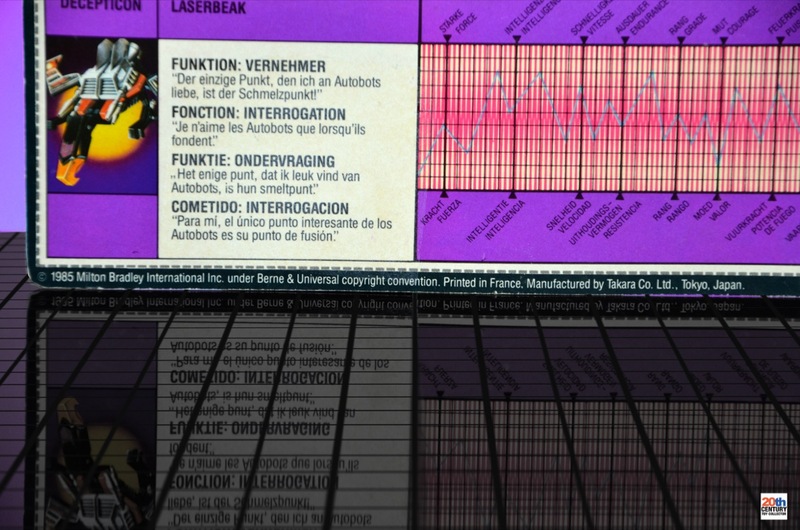 Laserbeak’s function, motto and tech specs are the same as on the American release, just translated into German, French, Dutch and Spanish. Right below the tech specs is the copyright and manufacturer info. The copyright is attributed to Milton Bradley International, Inc., which used to be the foreign arm (from a US perspective) of the Milton Bradley Company to which all the European Milton Bradley subsidiaries belonged. 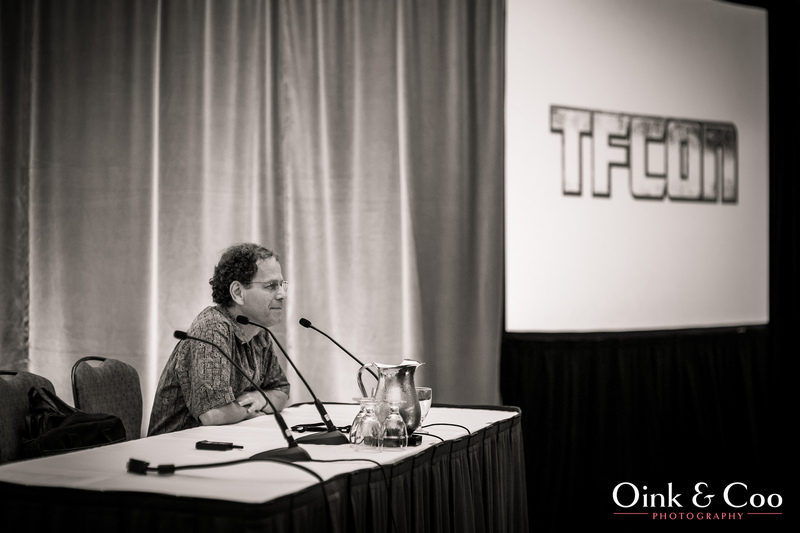 The copyright conventions being referred to (Berne and UCC) are explained in more detail in an article I wrote here. 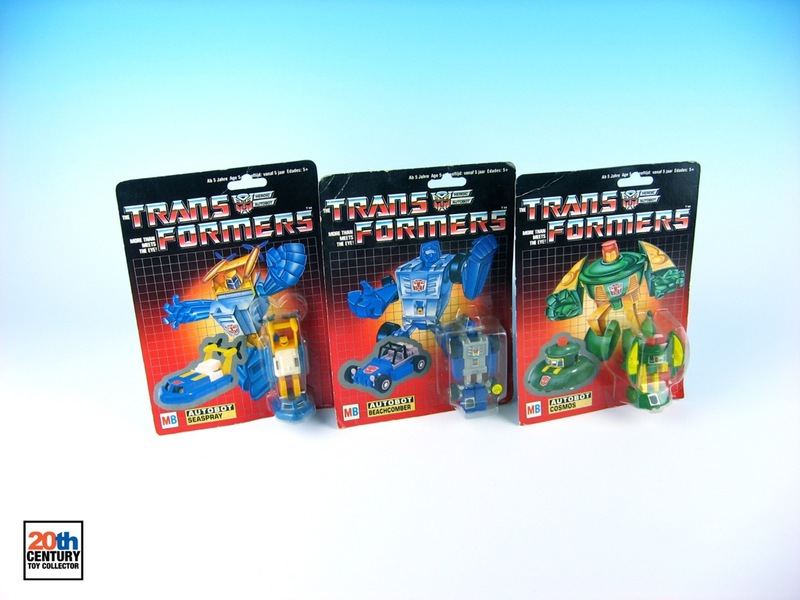 As for the manufacturer info: the packaging is printed in France and the toy itself was made in Japan by Takara. So why is it that Laserbeak was made in Japan, but the packaging printed in France? Well, because of this particular toy’s history as we examined at the beginning of this article! This Laserbeak was originally manufactured in Japan by Takara and sent to the French toy manufacturer Ceji to sell in France as the Diaclone Condor! When Ceji agreed to sell their remaining stock of Diaclone pre-Transformers (including this Laserbeak) to MB in 1985 for inclusion in their Transformers line the product was already in France, so the Transformers packaging was printed in France! Let’s continue our exploration of the back of the packaging. 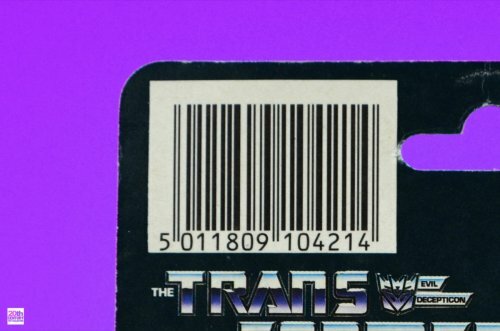 At the top left we find the barcode and underneath that there’s the Transformers logo. Let’s check out the barcode for a moment (yes.. I am going there). The first three digits of the bar code are the so called GS1 prefix, which signifies the country where the manufacturer is registered . 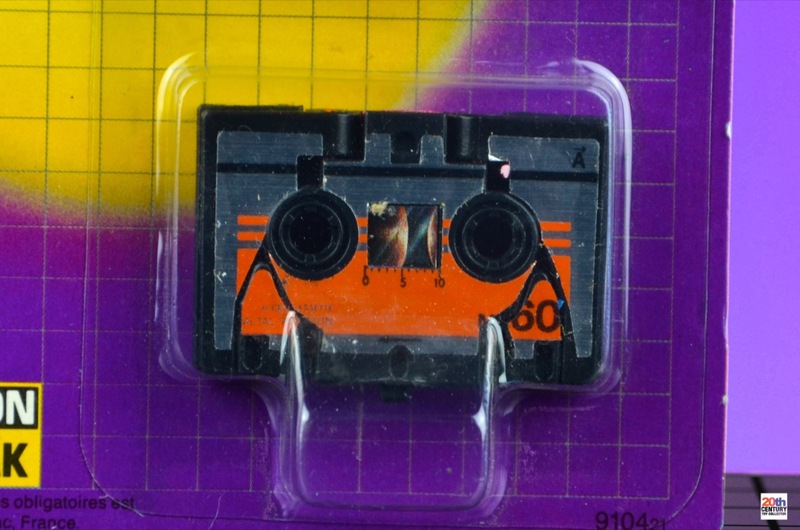 Laserbeak comes with “501″ as GS1 prefix, which is a code that belongs to the UK. This is interesting, because it suggests involvement from a company in the UK in the process of bringing this product to market in continental Europe. It’s pretty much a safe bet that this UK entity will have been Hasbro Europe (or Hasbro UK or whatever it was called in 1985). The next three digits are the company number, which is “180″. Hasbro Europe also sometimes used the company number “099″, but most Hasbro toys that were released in continental Europe up to and including 1987 came with a company number of “180″. From 1988 onwards the number “099″ seems to have become more dominant. Right after the company number the next six digits of the barcode are the item reference. The item reference here is 910421. That sounds familiar! That is exactly the same as MB’s SKU code for Laserbeak: 9104 21! This is actually a very common occurrence, i.e. 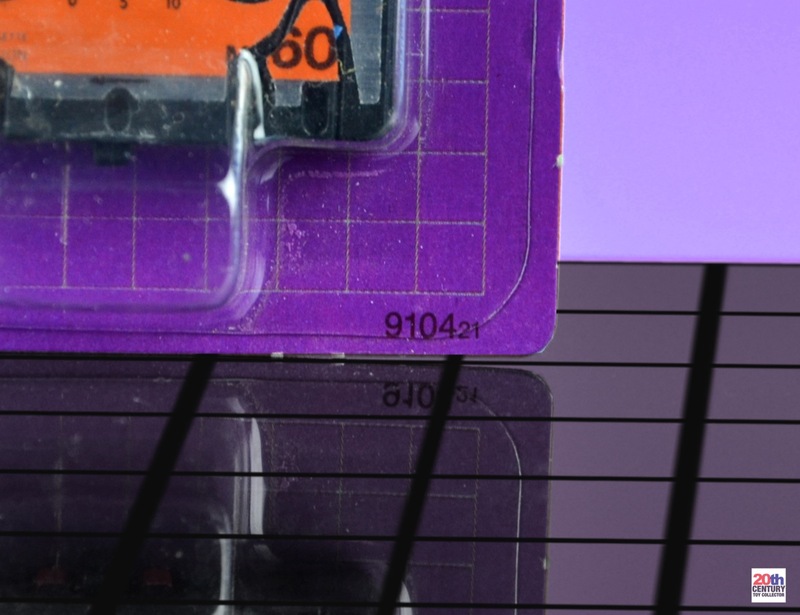 for manufacturers to encode their SKU numbers into the item reference section of a barcode. 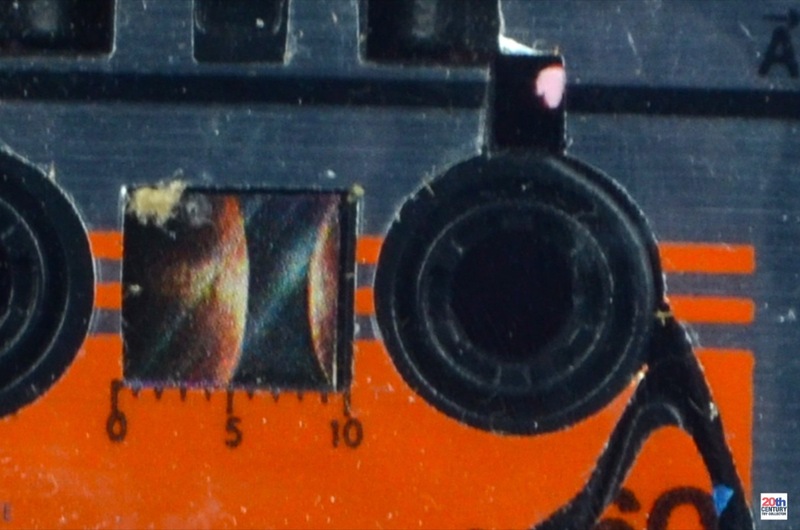 The last digit of the barcode (“4″) is not interesting to us, because it is simply a checksum digit (a mathematical error detection mechanism). It’s hard to say for sure if all these countries got MB Laserbeaks and if so in which quantities (or if any at all!) 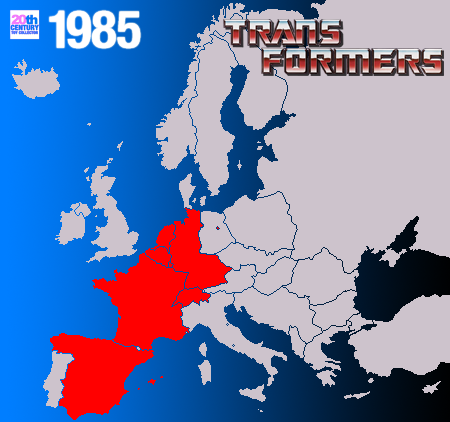 Exact details on distribution of Transformers in the early days in Europe is hard to find and I’ve learned through research that you shouldn’t assume too much based on just catalogues. Just because these Transformers were depicted in European catalogues did not mean it’s a guarantee that all of them were available in every country. 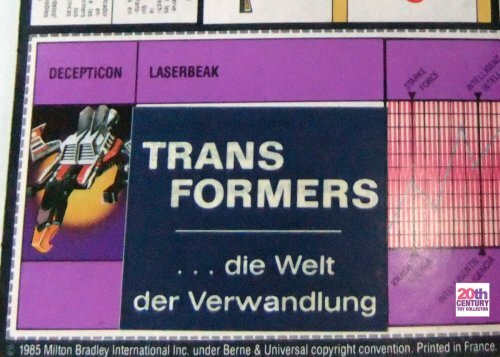 This sticker says “TRANSFORMERS …the world of transformation” and was undoubtedly added by the local German MB subsidiary back in 1985, which was ‘Milton Bradley GmbH’ from Soest, West-Germany. I know of one other collector who bought an MB Laserbeak from the same source as I did and that one came with that same German sticker on the back. Why did Milton Bradley GmbH add this sticker to Laserbeak’s packaging? Well, my guess is that they did this to make the product more appealing (or more understandable) to prospective German buyers. This particular portion of the packaging is probably the most conspicuous as far as the negative consequences of having everything printed in four languages is concerned. It might have been that Milton Bradley GmbH decided that four languages of text was too confusing for the consumer, so they decided to cover that up with this sticker containing just German text. When translated into English it sounds a little corny, but in German the text is actually pretty cool if you ask me. This type of customization for the local market is totally in line with everything I have seen so far in my research. 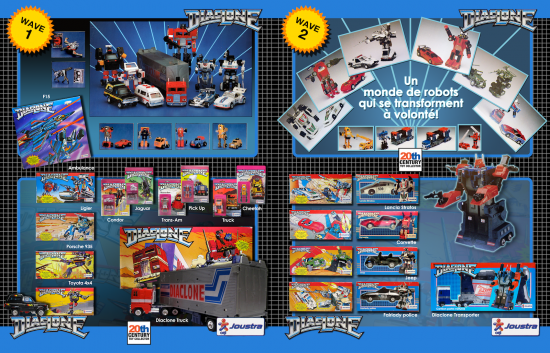 Hasbro delivered the product, but the local MB subsidiaries in the various European markets enjoyed a large degree of autonomy in deciding how, when and if the product was marketed and distributed in their home countries. I am pretty convinced MB’s Laserbeak was available in France as well by the way, because I have what I believe to be a loose MB Laserbeak and Ravage that I bought from a French seller in 2012. The MB Laserbeak and Ravage can be recognized by their unusual rub-sign placement and that leads us into the next subject matter I would like to discuss…. On to the matter of the rub-sign and that’s where things start to become a little peculiar. As most vintage G1 Transformers collectors will know, the rub-sign was a nifty little addition that Hasbro introduced in 1985 in an effort to distinguish their “real” Transformers toys from knock offs or (parallel/grey imports of) Diaclones. The rub-sign was a special heat sensitive sticker that would reveal the sign of the faction that the robot belonged to when exposed to heat, which was either the Autobot or Decepticon logo, coincidentally both trademarked by Hasbro. The rub-sign technology itself was also patented by Hasbro. Also, contrary to today, back in 1985 the heat sensitive rub-sign was probably a lot harder (and more expensive) to duplicate by unauthorized parties, even if the trademark and patent rights weren’t enough to scare them off. 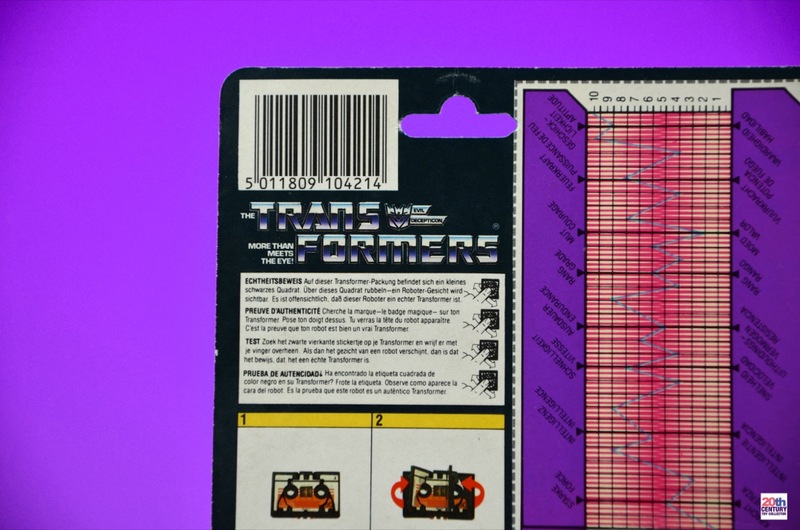 It was a relatively effective way of letting kids know that only the Hasbro imported Transformers were real Transformers! 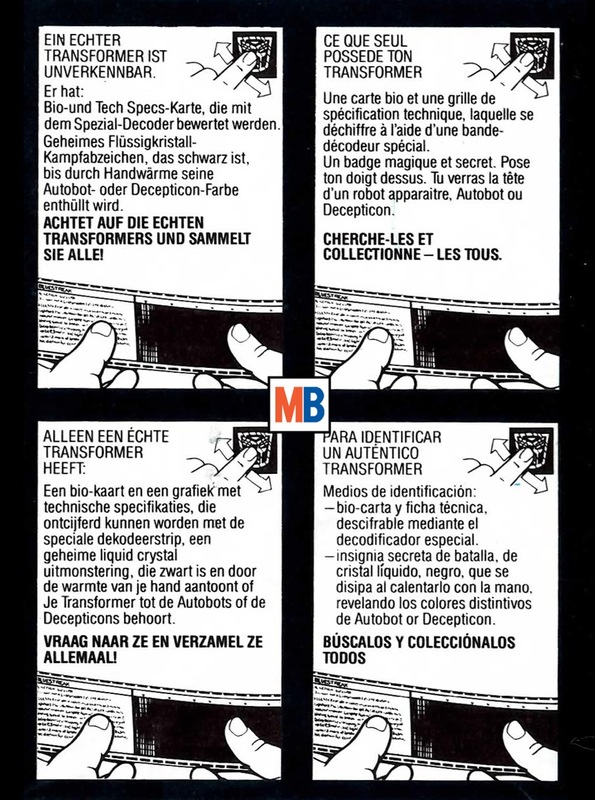 And here’s a photo of the back of the MB Laserbeak packaging which shows the rub-sign instructions in four European languages (German, French, Dutch and Spanish). Rub-signs are placed at different locations than where the American and Japanese releases would have them. and in some cases there would not be a rub-sign at all! This is really funny if you think about it. Here we have MB and Hasbro hammering home the difference between official Transformers and unofficial Transformers (“Hey kids, real Transformers have rub-signs!”) and on the back of the packaging of MB’s Laserbeak there are rub-sign instructions, but the actual toy inside the packaging does not have a rub-sign at all! I wonder if any kids returned their MB Transformers to the store back in 1985 claiming they were fakes, because they did not have a rub-sign! LOL! These imperfections puzzled me at first. It looked like a slightly used Laserbeak, but it was sealed tightly shut, so it couldn’t be! However, placed against the background of this toy’s history these imperfections start to make sense. There’s a lot of evidence that suggests that the French company Ceji did not only sell their stock of Diaclones to MB in 1985, but that they also took care of the rebranding process as well (the repackaging of their Diaclone stock into MB Transformers packaging). It seems there was a lot of manual labour involved there and the inconsistent rub-sign placements (or lack thereof) seem to be a testament to this. These MB Laserbeaks did not come straight off Takara’s production lines. 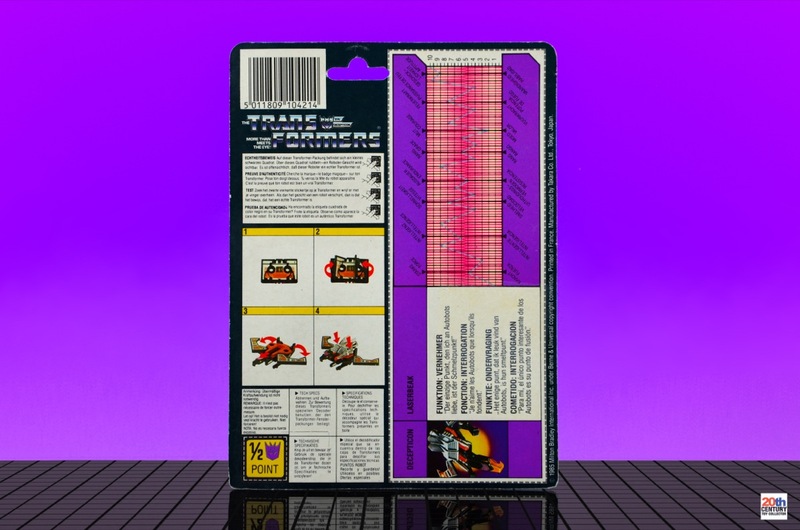 They were sent to France and some of them may have even ended up in Ceji Joustra’s Diaclone packaging before being reallocated to MB’s Transformers line. Who knows how the actual rebranding process worked and how the product was handled during this process. 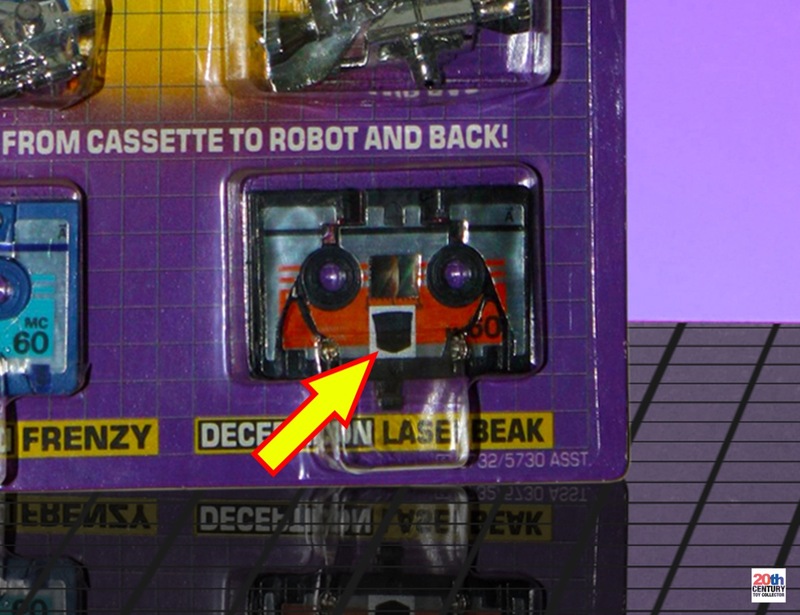 I hope you enjoyed reading this detailed look at MB’s Laserbeak. Like most other wave 2 MB Transformers it has a special history that is closely tied to that of Ceji’s Joustra Diaclone line, which only adds to its appeal in my opinion. I am desperately on the look out for the MB Ravage to place alongside my MB Laserbeak, but that item has proven to be the most difficult one to track down yet in its original packaging. If you ever find one or have one for sale I will gladly take it off your hands for a handsome sum ;-) Thanks for reading and see you back soon! Great piece! 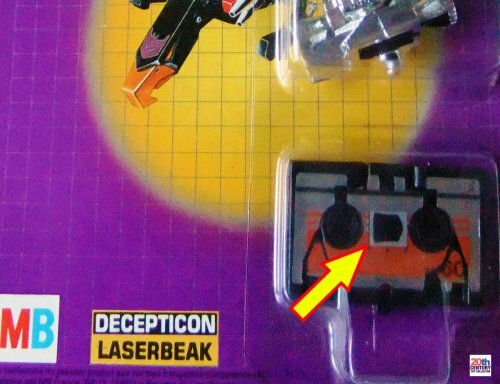 I’ve never seen an European Laserbeak before. Too bad they weren’t available when the cartoon was at it’s most popular, would have loved one of those. Good luck finding that Ravage! Thx Nicky! Yeah I never remember seeing Laserbeak in my local toy store growing up either! 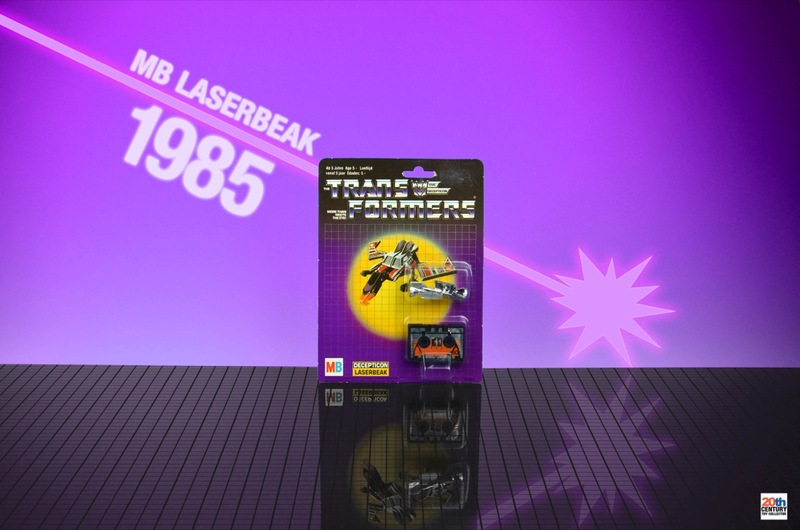 It would undoubtedly have been a seller, because Laserbeak was almost in every frickin’ episode of the cartoon back then! Distribution / availability was really a nightmare in Europe in those days. There was a significant lack of synchronicity between the cartoons/comics and the toys in the stores! 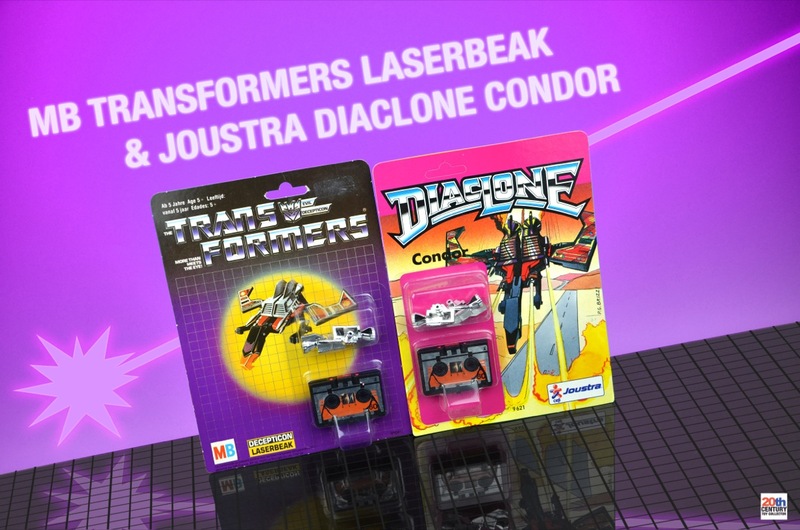 Great article on Laserbeak! 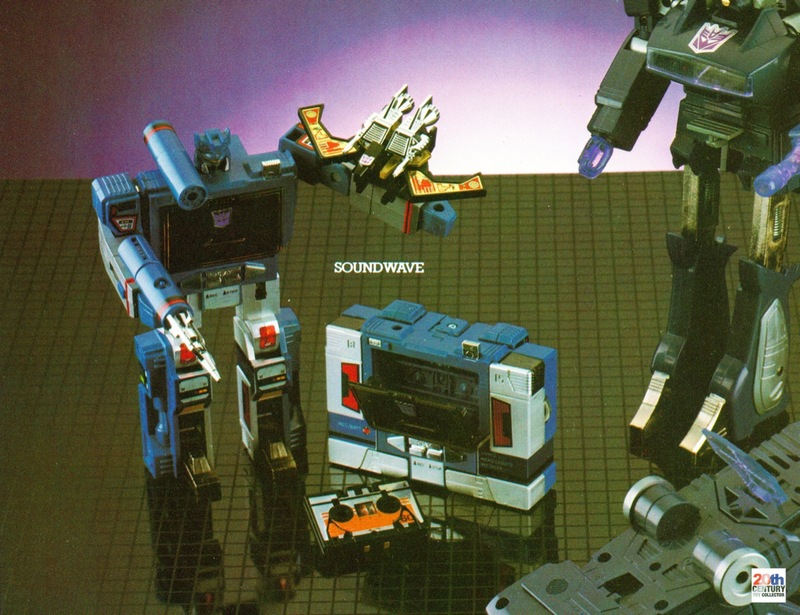 Wish I had one when I was a kid, I loved Soundwave and his cassettes the best. GiG never released Laserbeak in Italy, but there was a KO from Taiwan sold in a strange card called “Hi-Fi Robot”. Unfortunately I never saw any of those either. Great article again, nice bit of recycling, using newly acquired information! This is just too much awesome. Too much acurate and well-researched info, it;s such a relief to read articles where you reach the end with little to no questions. Mijo could it be that your Laserbeak had the rubsign attached but it was peeled off for some reason, or fell off before repackaging? Got caught on something between packages? That little rip could imply where adhesive was originally applied or something? @sjoerd: Thx for the comment. Hope everything’s going well in Abu Dhabi! @Maz: Thx brother. Glad you enjoyed the article. :-) As far as the sticker damage is concerned, I had the exact same thoughts about that as you did (brain sync!). It really does look like the rub-sign was peeled off, alhtough we’ll probably never know for sure. It might easily have been removed accidentally or manually. If you think about it, most right handed people would probably start peeling off stickers at the top left, which is exactly where the sticker damage is. It’s just too much of a coincidence that this particular example of sticker damage is located exactly at a corner where the rub-sign would have been placed. Again, we’ll never know for sure, but it’s fun to theorize! Oh and what Maz said. Another great article! Those packages are sweet. I hope you get your Ravage. By the way, if you ever happen upon another Milton Bradley or Joustra version of Huffer that you’d like to sell please get in touch with me. jshannon247@comcast.net . Thx dude! :-) Will do! Wow man, I can’t believe you did the barcode :) Very informative, I never leave your site without learning something new. I remember it from late 1985 as well as ravage here in madrid, but they were the fastest transformers to sell out because of its price. These two, the minibots, constructicons and insecticons ran out fast because they were the cheapest ones when the kids wanted one transformer. 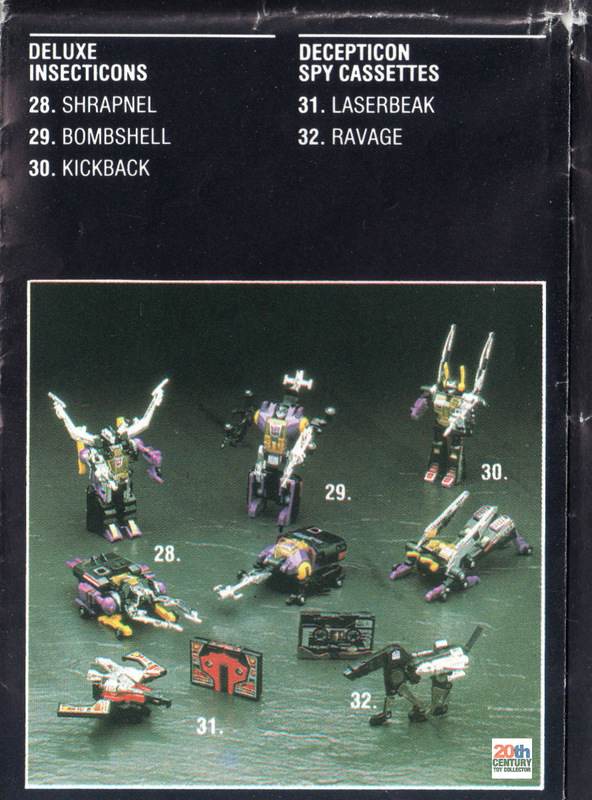 To the mb catalog you should add the devastator giftset sold here at that time… I remember the blistered constructicons were mb, but the devastator could be a hasbro import….? Extremely fashionable. I get quite a lot of compliments. My favourite m6prh http://m6prh.ml/ to convey!